For those not in the know, Vermintide is a first person whack a mole simulator, only replacing the moles with rats, and the giant squishy hammer with a varied assortment of swords, guns, bows, axes and steel hammers. Set in the Warhammer Classic universe, the game tells the story of a small band of survivors who are trying to live through “The End Times”, a time in the Warhammer world’s lore were the gods of chaos have decided they are bored, and plan to wipe the slate clean. Unfortunately for our survivors the foot soldiers of this apocalypse are a swarm of half-man-half rat creates known as the Skaven, and there are a bloody lot of them. In fact, the swarms of enemies coupled with the clean yet concise UI harkens back to Valve’s Left4Dead series, and I know I’m far from the first person to make that comparison. The difference between Left4Dead and Vermintide really boils down to the melee combat. This makes up a core part of Vermintide, and is both meaty and well executed. Weapons make a sickening thud (hammers, shields) or a satisfying slice or stab depending on sword/axe or dagger. On top of that the ranged weapons also have some weight behind them, with the Rangers crossbow easily allowing you to pin a Skaven to a wall with minimal fuss. 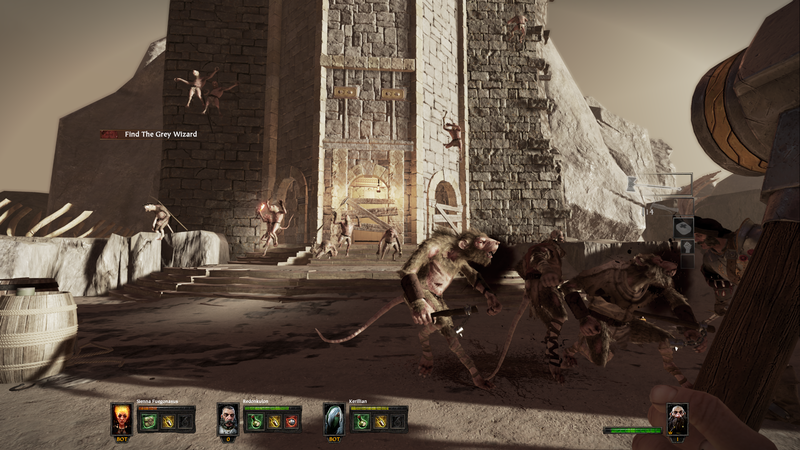 This is rather pleasing, especially as you’ll frequently find yourself and your party up to your neck in rat men, and you’ll just spam axe strikes left and right to thin the crowd, scattering blood and gore everywhere. Alternatively, you can lob some explosives if you happen to find any, to send a shower of dismembered rat-men-parts all your fellow team mates. Speaking of team mates, this is where Vermintide lives or dies. 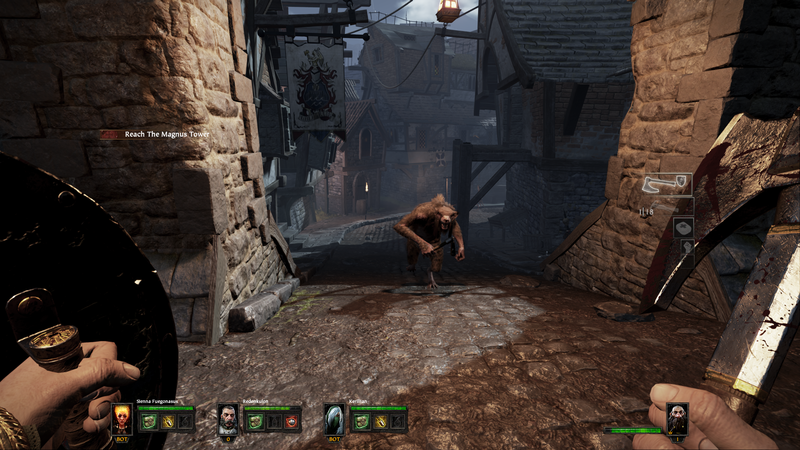 If you have three friends who you can play with reliably, Vermintide is tonnes of fun. You’ll find yourselves yelling out expletives and keeping an eye on the end of game kill counter to use as bait to wind your friends up with. This in turn is also helped by the in-game banter between characters, who often compliment each other for good kills, or chuck insults out when it gets too quiet! Unfortunately I found playing with random people to be a rather disjointed experience. No one really talked and just ran on ahead, and only really spoke in chat to blame others for them dying. I mean if you sprint off and attempt to solo the Rat Ogre, what did you expect? 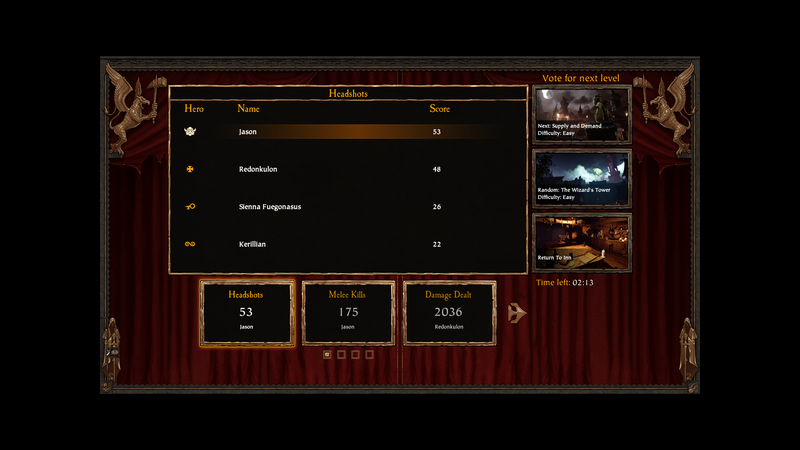 Unfortunately Vermintide did little to change my mind on the majority of other players being a bunch of selfish gits, especially when some people would just join the game and stand at the beginning, only running to catch up towards the end of the level just so they could get their dice roll (the game awards an item at the end of the run based on a dice roll). This happened to me at least three times, and none of us could work out how to kick these people, so in the end the other players just left the game. Playing with bots was a little bit more bearable, but I couldn’t drag myself to do it for the entire campaign. In regards to the loot system, I thought this was rather clever: At the end of each level you roll some die to establish what kind of weapon you get. You can improve this change by finding additional loot die as you progress through a level, and also by carrying a tome to the exit you’ll ensure a special dice is given to everyone in the team, that has a higher chance at success. I’m not sure if it’s possible to not win an item (I always received one at completion of my runs), though sometimes you’ll end up with duplicates of some items. On the plus side the game has a forge mechanic that allows you to break the item down and reuse it to make something else, so I’ve yet to be too disappointed with multiple identical items. It’s worth mentioning that loot items are not class specific, so you may well find that you play through as the Ranger and unlock something for the Bright Wizard. I’ve seen a lot of complaints about this system, as well as a lot of praise for encouraging you to try different classes. I fall strictly into the latter camp in this, and have been encouraged to try the Witch Hunter when I got a rather swanky multi-barrelled pistol unlocked after finishing a game as the Ranger. 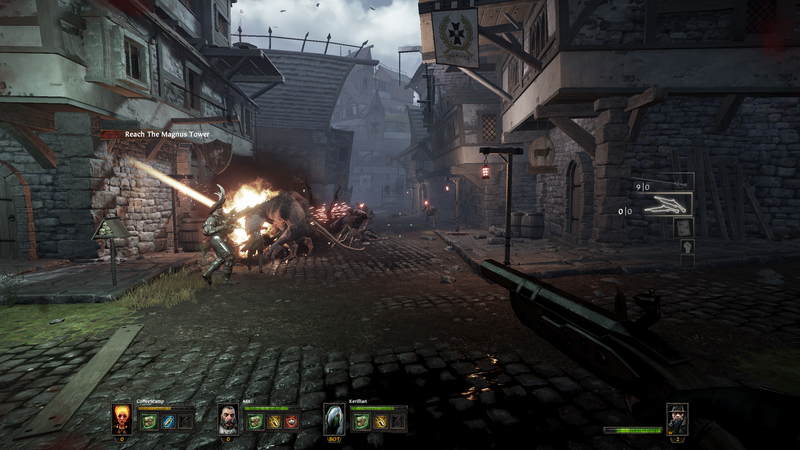 Overall I can say the following about Vermintide: If you enjoyed Left4Dead and will have some friends you can reliably play with, then it is definitely worth a shot. It looks pretty, the gameplay is solid, and the combat is nice and meaty. If you don’t have any friends who are interested, then it really depends on your love of random players, and whether or not you are a big Warhammer classic fan. I feel for a hard-core fan your love of the source material may last you through a play through with other players or bots, but if you aren’t a big lover of classic Warhammer (like me) then it may not sustain you and you find yourself getting annoyed with other players and / or the AI. I base my below score assuming you’ll be playing the game with friends, as this is where I got the most out of it. If you won’t be playing with friends then consider this a 3/5, as it really is the multiplayer that makes the game. 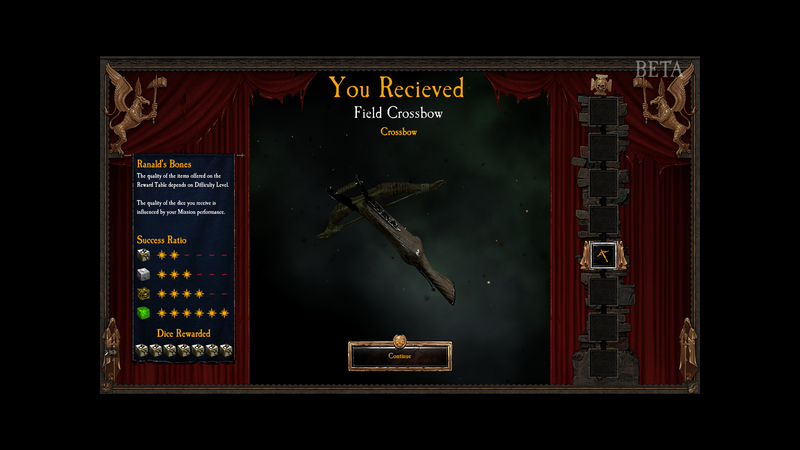 Final Verdict: 4 out of 5 – hectic melee heavy fun with friends, with a well-executed Warhammer twist. Warhammer: End Times Vermintide Out Oct 23rd 2015! This entry was posted on Wednesday, November 4th, 2015 at 6:55 pm by Jason and is filed under Reviews. You can follow any responses to this entry through the RSS 2.0 feed. You can leave a response, or trackback from your own site.